You may remember our strategic RACE framework which we created to provide a means to contextualise digital marketing tactics. We've developed this with a new visual to show a planning and management process to use on marketing projects. 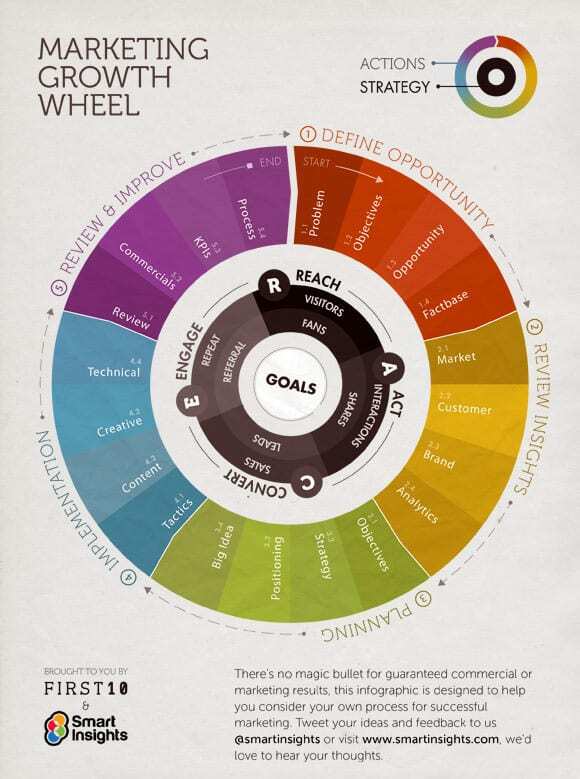 Our new Growth Wheel infographic developed in collaboration with First 10 Digital, aims to provide a visual way to think about your marketing planning focused on creating commercial growth by integrating digital channels. Our Growth Wheel uses a standard SOSTAC® approach to planning, but applied to using digital technologies and channels to create growth for a company. It's based on our experience in planning and implementation for many projects we've been involved with over the last 12 years or so. We've designed it so that it can work across a range of sectors and company sizes. At its heart, it's focused on how to achieve business value through interactions with customers online and offline. The centre of the chart shows the broad goals to consider that can be delivered through effective customer interactions in lifecycle of Reach-Act-Convert-Engage. 1. Define opportunity. Understanding the context of the main challenges facing the business and opportunities available with initial selection of specific SMART objectives based on a current factbase. 2. Review Insights. Focused on understanding customer use and needs from different channels in the context of a marketplace analysis reviewing competitor propositions and marketing activity and the strength of intermediaries. 3. Planning. The objectives are refined and strategies developed to align with them. The big idea involves devise a strategy at the intersection of brand, customer and content which is engaging and shareable. 4. Implementation. The technical development and project management for developing the content and platforms to deliver a shareable experience. 5. Review and Improve. Continuous improvement based on review of commercial targets and optimisation of the channels using analytics and testing.